We are involved in providing Oil Mill that is used to expel oil from oil seeds like ground nut oil, soya bean, sesame seed, rep seed, palm kernels, mustered seeds, castor seeds, cotton seeds, sun flower, and copra. 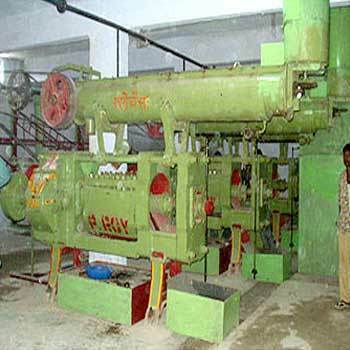 The seeds are passed through the oil seed crusher or copra cutter in the desired amount. The elevator gets stored just above the expeller where required amount of heat is transferred. The oil seeds thus gets soften and oil gets separated from the crushed oil seeds. It is then stored in vessel and then sent through scanner, filter Press and micro filter. The finished oil is suitable for edible purpose depends upon different type of oil seeds. The capacity of the Oil Mill is 1 tonnes per day to an availability of 30 tones per day available. Shardhha Enterprise, welcome to our valued Customers. SHRADDHA ENTERPRISE made its appearance in engineering and development field way back since 1972. started by young entrepreneurs who were full with enthusiasm and vigor and who wanted to make use of their talent, education and experience in Vegetable oil Industry and various field can take care of its clients? specific needs. Right from its inception Shardhha Enterprise, have specialized in implementation of turnkey projects for development and exporting of various type of machinery in different parts s of India as well reaching Globally and serving various countries world wide. Shradhha Enterprise with commitment to quality , explore new idea and technology with our continues effort in technology improvement and takes the pride in high satisfaction to fulfill the requirement of the clients? or customers as our motto. Shardhha Enterprise have successfully made and completed machinery and projects like Oil Mill Machinery Edible Oil Refinery BSS Castor oil Machinery Plant Solvent Extraction Plant . Abrasive Plant Mchinery Soap and Detergent Machinery Plants Rotary cold Press Rice dehulling Machinery Animal feed Plant Machinery Ice Making Plant Dehulled sesame seed plant Machinery Cloth washing Plant Chemical and allied machinery and Equipments and few more in our infrastructure development globally. Shardhha Enterprise, always eager to intake your outsourcing work of development plant like Oil refinery , Oil Mill Machinery , solvent extraction Plant, abrasive Plant or any short of plant development opportunity word wide. Shardhha Enterprise, guarantee once our relation developed with client will grow with greater level of satisfaction with our work commitment and technology expertise. We always believed our profit is satisfaction of our valued customer.